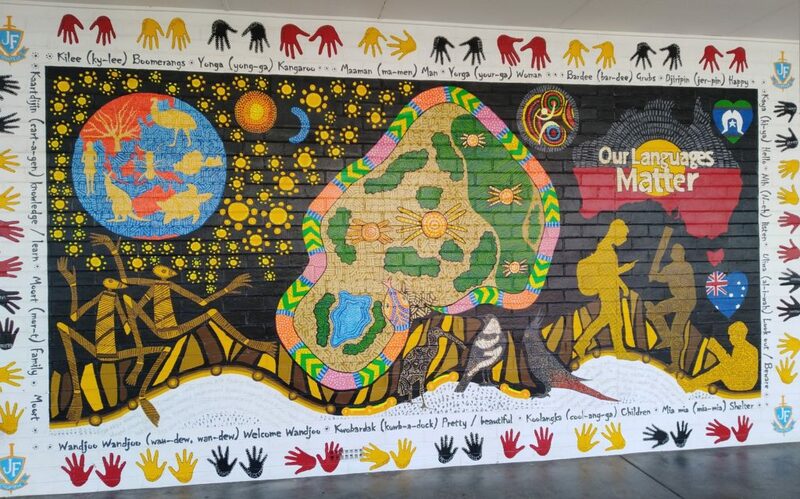 On Friday I had the opportunity to represent the City at the opening of the Indigenous Art Mural at John Forrest Secondary College. As with most indigenous art, there is a story behind the picture, and I’ve held an interest in this particular story for some time. About twenty four Aboriginal and Torres Strait Islander students participated in this NAIDOC project. The students worked on every aspect of the mural including the design concept, wall preparation, mock-up drawings, enlargement and transfer of the design to the wall and finally, paint application. Each student traced their hands in the outer border of the work with their names – they should all be very proud of their creation. The inner border contains phrases and words in Whadjuk Noongar language with English translations and phonetic pronunciations. Many more details on the work, and rationale for each section, are in the fact-sheet issued by John Forrest. My picture doesn’t capture the vibrancy of the colours, however you can tell that it is a very good artwork. Even better than that though is the message. And they certainly do, but they are under threat; and this mural is so good because it brings people’s attention to that. To my knowledge, there were about 250 distinct language groups at the first European contact, and most of the languages had several dialects. Today only about 120 of those languages are still spoken and many are at risk of being lost as Elders pass on. For me, I first became aware of the threat when I was working in the Pilbara and my wife spent a week at a sacred site in Millstream with some linguists who were recording stories from the traditional custodians – the Yindjibarndi people. A few years ago a teacher of my sons asked whether the City of Bayswater is doing anything about recording traditional languages from the area. We weren’t, and we aren’t, but it is probably time we started. If the languages are not going to be passed on, then at least we could record the ones still in existence for historical purposes. Hopefully this is occurring all over the country, just like the Wirlu-murra Yindjibarndi Aboriginal Corporation has been doing in the Pilbara. I’m ignorant on whether there was more than one dialect of the Whajuk people (who are the traditional owners of City of Bayswater region), but no matter how many, I think it would be appropriate for the City to have a specific web page talking about the traditional custodians, and which include stories on the locality in the traditional language/s. A teacher at John Forrest told me that a number of years ago an Aboriginal grandmother told her that the waterway on land adjacent to the school (Nora Hughes Park) was a traditional Aboriginal birthing site. This type of information needs to be recorded somewhere, and if not by the City, then who?